Thanks for the great question, Faisal! I know the podcast is heard all around the world but I’m still a little taken aback when I hear from listeners from so far away as Dubai. There are actually a couple of ways to protect a file from being viewed by some other person – a low-security way, and a high-security way. Both are free, and neither one is very difficult. 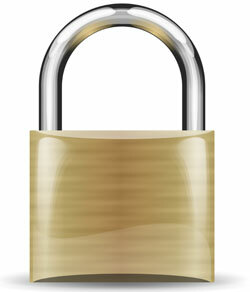 I’ll talk about the low-security process today, and next Monday I’ll go over the more secure process. This process does not require any other software other than Windows, and it will work on Windows 7, 8 or 10. It is based on the premise that a nosy person can’t peek at a file if they don’t know it exists. Now, I should say up front that this method will not stop anyone that is even a little bit tech-savvy or knows a little bit about how Windows works. But it would be effective for a large percentage of computer users. Does anything there stand out to you? 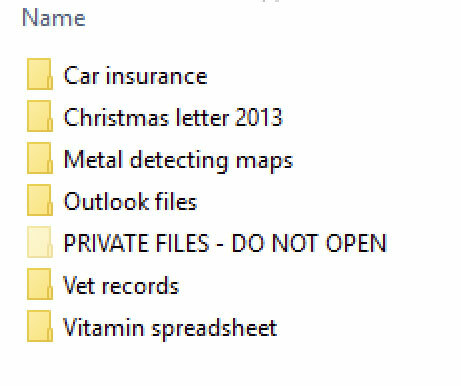 Of course, the “Private files” folder. Anyone who’s even a little curious would probably click on that to see what’s in there. Which is exactly what you DON’T want them to do. 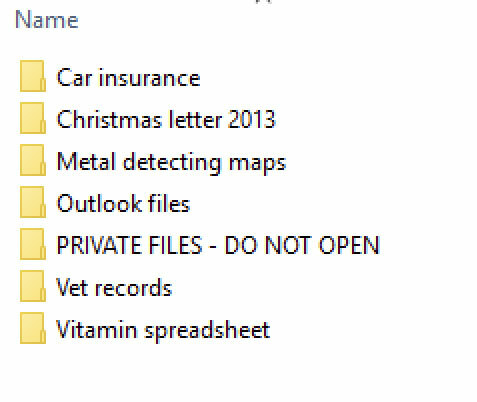 So what you need to do is HIDE that folder so that it’s still there, just not visible in that list. Keep in mind, you didn’t DELETE that private folder, you simple designated it as HIDDEN. So no one sees it, not even you. In order to see it again and access it, you have to tell your computer that you want it to display any files or folders that are designated as “Hidden”. You can kind of see that the “Private” folder is visible, but the icon is a different color than the other icons. 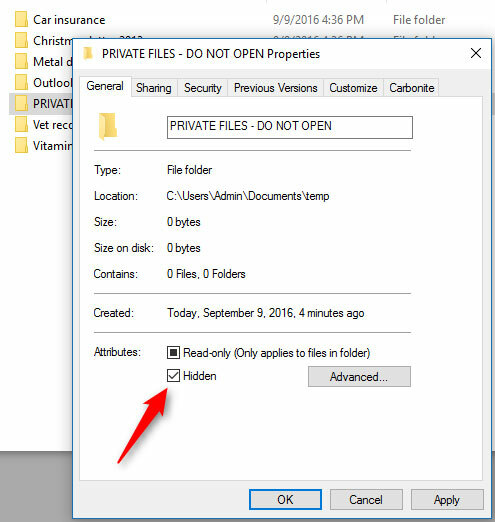 That is just the indication that the folder is designated as “hidden” but you can still see it because you told the computer to show you the hidden files. 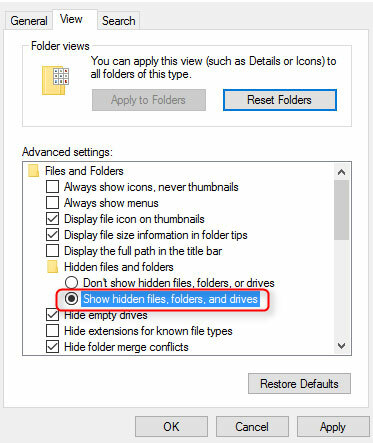 If you want it to not be seen at all, just go back to the previous step and choose “Don’t show hidden files, folders or drives”. 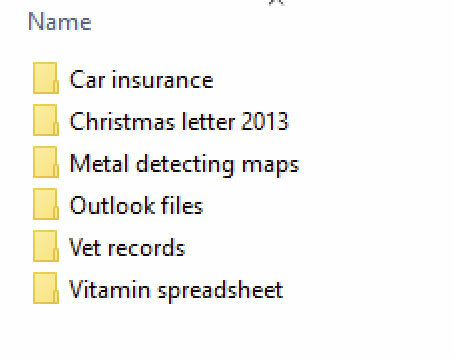 How critical is it that no one sees that file or folder? How “computer smart” is the person you’re trying to hide it from? If the file is super-duper private, or the person might know how to do what I just showed above, you probably won’t want to use this method. A week from now, I’ll show you another process that uses a free piece of software and it’s much more secure. As always, great tip. I am looking forward to Part 2. Thanks again for all your hard work.